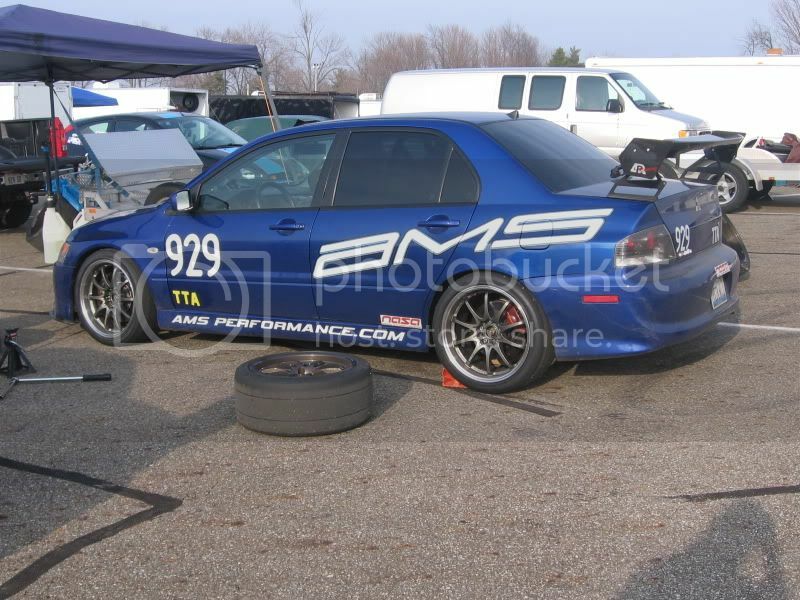 AMS Sponsored 929 Evo - Mid Ohio TTA Track Record! Automotosports - Illinois Automotosports is a Chicago based tuner specializing in 4G63T performance. With an in-house fabrication facility and engineers on staff, they will be bringing you the best in Lancer Evolution parts. 466 miles and 7.5hrs to Mid Ohio! My Saturday morning arrival was foggy and a bit cold - but worlds better than the Friday testday that was full of rain and 48 degrees for a high. I mounted up last years Hoosiers and put down my first ever 'dry' lap at Mid Ohio of a 1:43x i think to secure a gridspot near the front of the 40 car field. In S2 I had a 1:42 on my first hot lap just as things were warming up. But on lap #2 I went wide into T8 and spun it. Fortunatley I stayed on track and nothing was damaged. With NASA you lose your times if you spin or go offtrack, so I had no official time at this point. We had a decent break over lunch and we decided to change the AoA on the ARP wing I was running. Here's where things went wrong... Not sure if it was hosed before or during our adjustment attempt but we had the adjustable rod screw break off inside the nut. We tried drilling it, pounding a hammer into it, pounding a screw into it, using vicegrips to turn the hammer/screwdriver - nothing. It was hosed. I did have a close neighbor (Mark; aka Brad) with a sweet ITR and the same wing! He agreed to let me borrow the supports when our schedules worked out. So we had a plan! It was nearly time for S3. With little time left, I pulled the wing off completely and for S3 and figured I'd do some 'testing' as to running wingless! Let's just say the car was a bit loose! Braking down the backstraight from 140+ was very loose and any corner entry was loose. So I adopted the brake - get back on the gas - then turn in - method and pulled a 1:43. S4 & S5 I was able to switch in the borrowed mounts and run with the wing! simply used whatever angle Mark had which was a lower flatter angle and what I was planning on switching mine to anyway. And the track was pretty much dried out except for a few key spots (namely T1 under the bridge). I mounted up the stickered Hoosiers and tossed down a 1:39.9 and climbed into 2nd; sandwiched between 2 Corvettes. I reset the tire pressures for S5 and put down a 1:38.8 taking 1st for the day and just .4 off the track record. Sunday it was wet; again, as it rained overnight. I skipped S1. In S2 I put down a 1:39.4 and slotted into 2nd as the Corvette in front of me broke the track record! S3 I had planned on being my last of the day as I had a solid 7.5hrs home but I had issues. Basically I was late to grid because I was waiting to switch in the wing mounts (remember I'm sharing them so we keep frantically switching them from Mike's ITR onto my car and vice-versa). I only got 1 hotlap in as I had a 2 lap penalty and had to work through the slower traffic and play nice; no improvement. I stayed for S4 - and ran a 1:37.6 re-breaking the Club Course track record! The time held up and I got my first record of 2011 at Mid-Ohio. Vid Below. I've got to thank AMS Performance for fixing some boost leaks and retuning the car. It's running even smoother than before and hitting 143mph on the backstraight. I beat on the car to the tune of 210 miles this weekend with no issues. The tune is smooth and powerful! Keep in mind I'm still on the stock turbo, stock bottom end, stock trans, etc. Also to Aaron @ Winning Formula for the alignment and setup on the new suspension - and also for taking some tire temps for me Sat. The car feels great; but we have a laundry list of potential tweaks already! Overall; Mid Ohio is a lot of fun. It's super technical and it's faster - a dangerously fun combination. Blind corners, off-camber turns - and combinations of each! Plus a huge backstraight, and if you're running the Pro Course I'm assuming an equally huge frontstraight. I unfortunately had 2 car-buddies find the wall this weekend and they have some repair work! Congrats on breaking the Club course record! Just like Chris said when he tuned it - the powerband is very smooth; even better than before. Had a smilar race in 2009 where we lost the rear wing and had to run wingless. Crazy sideways, really fun, and thought no way was it quick, but we set FTD that run. Topped out at 148 on the "straight" at the beginning of the course...on dirt. Last edited by DaveK; Apr 16, 2011 at 01:45 PM. Nice to hear someone prove that the wing helps the Evo at higher speeds - Curious what speeds you felt the looseness. Is that a gtc-300 or 200 with risers? Also, I have run into the same issue with those adjusters, I had Peter at APR send me a set for free which he sent out ASAP. I felt the loosest braking down the backstraight which was just over 140mph down to 60mph. That's really the hardest braking zone. I've got the 200 wing with extended risers; it's the smaller one. And after 6 days on track with it, I'm not noticing a huge difference over stock. It's really quite hard to quantify as I also changed to a different suspension. Bad A$$$ NATE! Can't wait to be on track with you again, always a good show! You bet. Car is running even smoother this year since Chris had a chance to update the tune! AMS has a trackday coming up in June, but I'm not sure if I can make it. It conflicts with a NASA event up in Michigan that I was tentatively going to - plus that's the weekend either before or after our big IT upgrade at work! 929 Evo - Mid Ohio - 1st in TTA and track record! 929 Evo - NASA TTA Win & Track Record @ Gingerman! 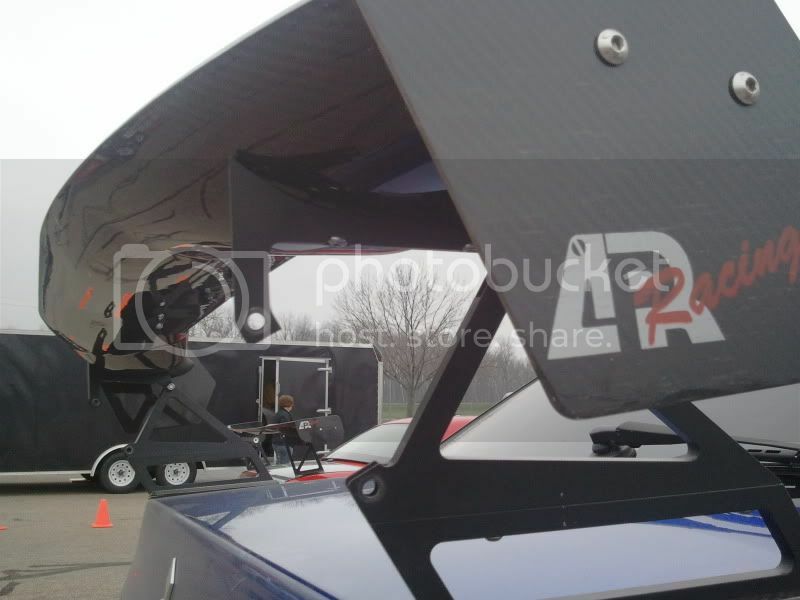 Quick Reply: AMS Sponsored 929 Evo - Mid Ohio TTA Track Record!